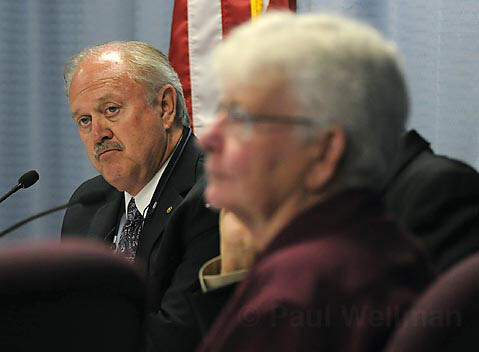 OFF THE BALLOT: Goleta Mayor Michael Bennett (left) and Councilmember Jonny Wallis were among those who chose to pull a long-discussed city tax from the July 1 meeting agenda. While slow-moving tedium usually defines City Council meetings, Goleta’s was abuzz with meaningful activity on Tuesday evening. As the smoke from the Gap Fire off West Camino Cielo Road hung above the mountains across from City Hall, decisions were made about issues Goletans have been watching anxiously. Not least on this list were two proposed measures for the November ballot-one to push a renegotiation of the revenue neutrality agreement with the county, and the other a half-cent sales tax measure for the City of Goleta that may very well have put the brakes on the county’s Measure A. If approved by voters this November, Measure A would replace the expiring Measure D, a major funding source for countywide road maintenance and improvements. In order for the sales tax measure to be included on the ballot, four of the five councilmembers had to approve it, and councilmembers Roger Aceves and Jonny Wallis were opposed to it. “We all have to work to get Measure A passed. A lot of cities depend on it,” Aceves said, adding that the council had agreed to pull the proposed measure from the July 1 agenda by consensus. Mayor Michael Bennett delivered a dramatic speech, saying that the council’s commitment to other communities in the region cannot be overshadowed by its commitment to Goletans. “In the spirit of teamwork and shared regional responsibility, we cannot let Measure A fail,” he said, in tacit acknowledgement of the fears a Goleta-specific tax will cause a sufficient number of voters to shy away from Measure A at the polls to ensure its defeat. Bennett also stressed the need for working with the county to ensure that a revenue-sharing agreement satisfactory to both sides is worked out. “There is no good that can come out of an adversarial relationship,” he said. “We are in agreement that the city and county will negotiate in good faith our current revenue neutrality agreement.” Bennett said that the council has not yet met with County Executive Officer Mike Brown, who is currently on vacation. Despite his objection to this temporary solution prior to the entire camp’s eventual relocation away from the neighbors’ houses, Onnen voted consistently with the rest of the council to approve the farm’s housing improvement project. However, this approval was accompanied by a stern warning from Bennett that the council is committed to enforcing the project’s timeline. The members of Fairview Garden’s new Board of Directors promised that building anything-a yurt or otherwise-before a project has been properly designed and considered would be counter-productive.